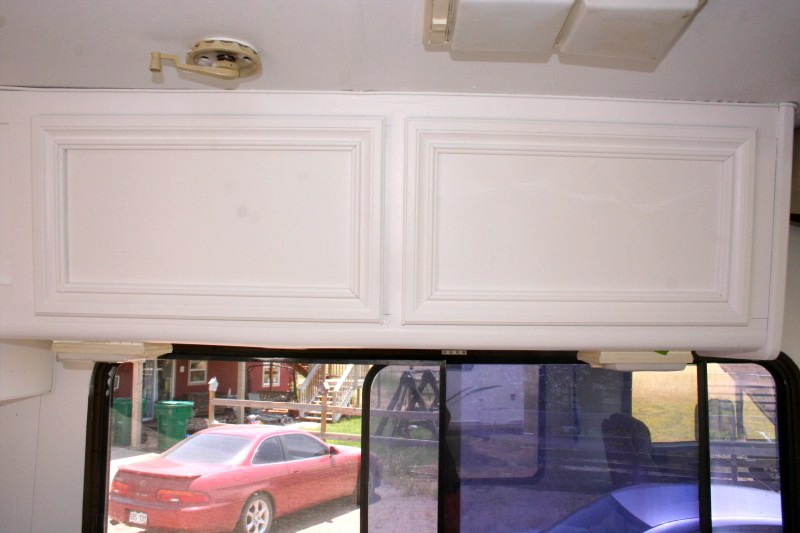 Read how one mom transformed the interior of her family's thirty year old motorhome with a power sprayer and some light colored paint. Jarrett and Chelsea of OurSonnyLife have a special story to tell about losing their son Trek to a rare genetic disease when Trek was only 14 months old. The disease is called Niemann Pick Type A and it affects only 1 in 1,000,000 babies. 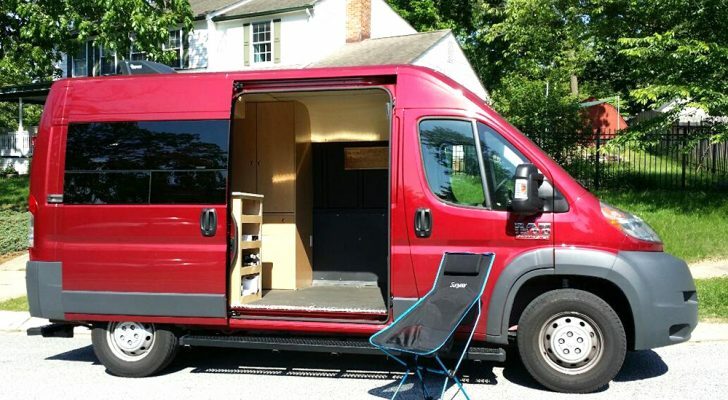 After their son’s death, they decided to renovate a motorhome and do a lot of traveling with their other children. 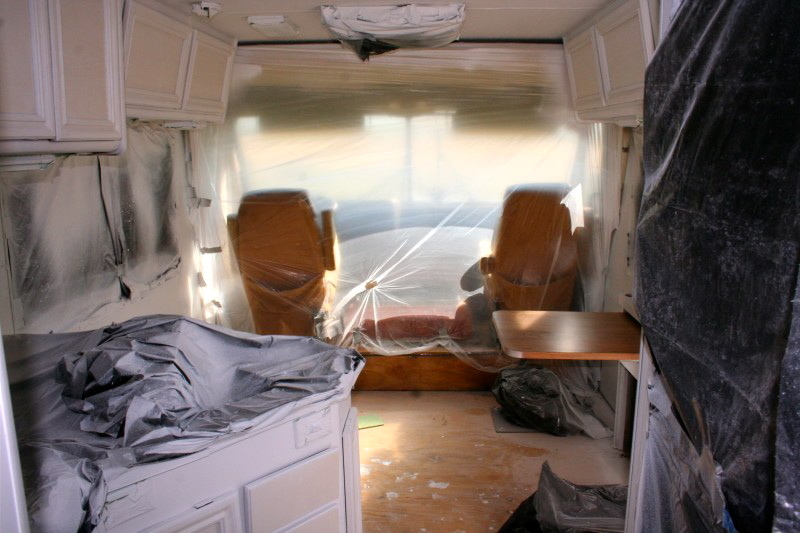 Chelsea let us share some of her photos and experiences in spray painting the interior of her family’s motorhome. 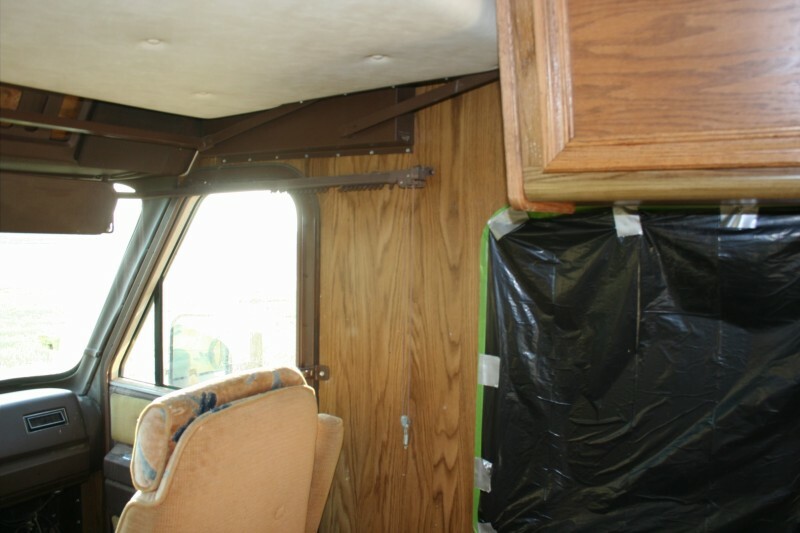 Here’s an outline of what Chelsea did to make the inside of her thirty year old motorhome look better than the original. 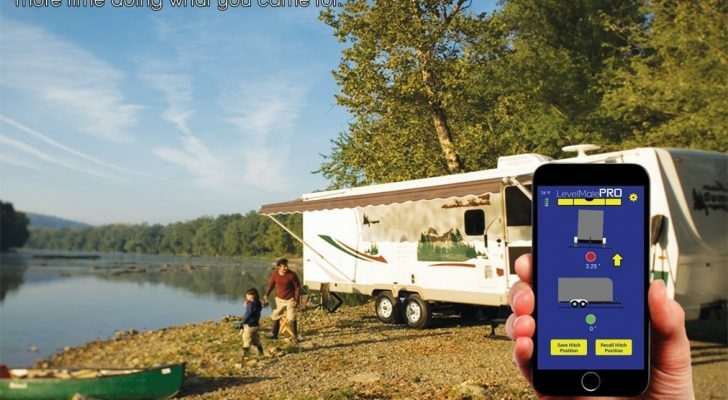 Jarrett and Chelsea lived in their thirty-five foot 1985 Pace Arrow motorhome nicknamed Adventure for 6 months. 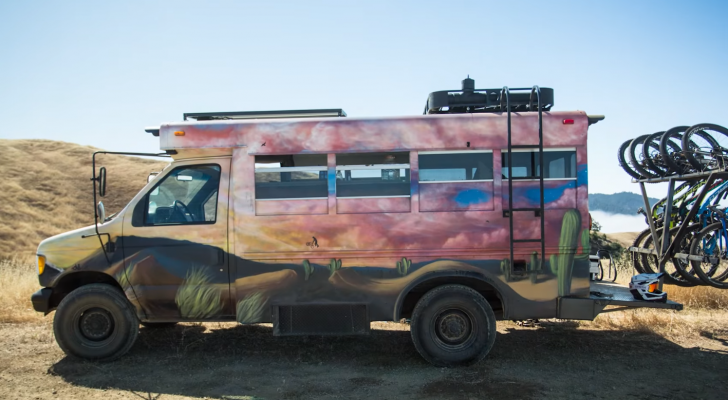 She said that they had a hard time finding good information on spray painting the inside of an RV, so they set out on a do-it-yourself mission. Not knowing any special tips and tricks, Chelsea and her kids started to paint the old-fashioned way: with a brush and some primer. But brush lines were obvious on the cabinets and walls and the paint didn’t stick to the finished cabinet wood, so she decided to try spray painting. If you decide to spray paint instead of using a brush, taping off the surfaces you don’t want paint to get on is super important. Painter’s tape is a special type of masking tape that produces clean edges when paint is applied over the seam. If you use regular masking tape instead of painter’s tape you’ll get fuzzy edges and a less-than-desirable outcome. Problem is: painter’s tape is pricey. You can save money by using newspaper and trash bags to cover most surfaces, and just use painter’s tape for the critical areas that will be easily seen. 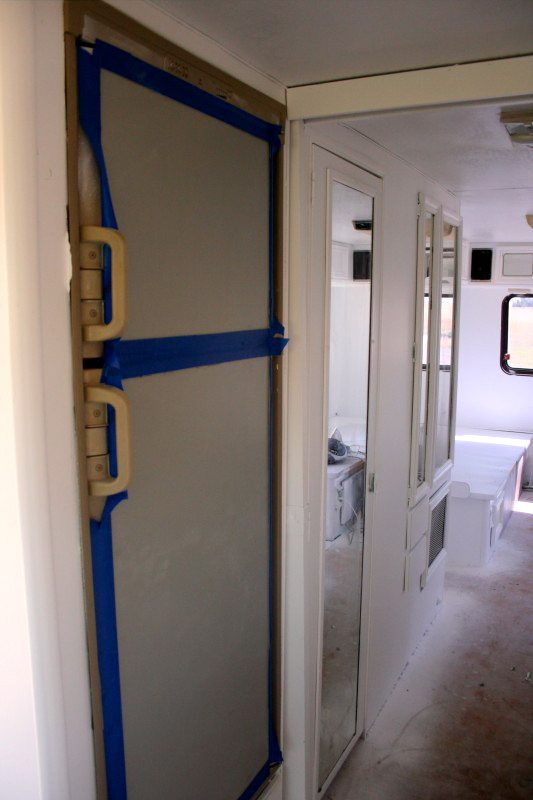 Taping off an RV prior to painting can be a bear of a job. 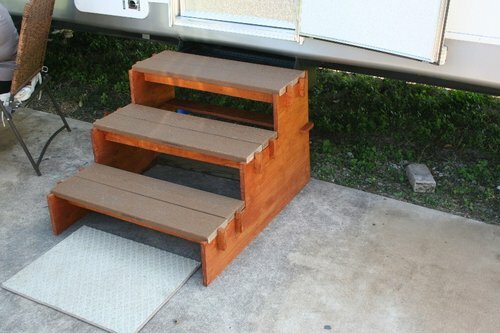 The smaller space brings more corners and little nooks. It’s a lot different than just taping some trim work in a full-size house. Did you know this about painter’s tape? House painter’s tape is rated by how many days it can be left up without leaving residue on the surface being masked. It is available in 1, 3, 7, 14, 30, and 60-day ratings, with the 7- and 14-day tapes being the most common. The longer-rated tapes are typically less adhesive, and are sold for use on smooth, delicate surfaces such as vinyl wallpaper and recently painted walls. 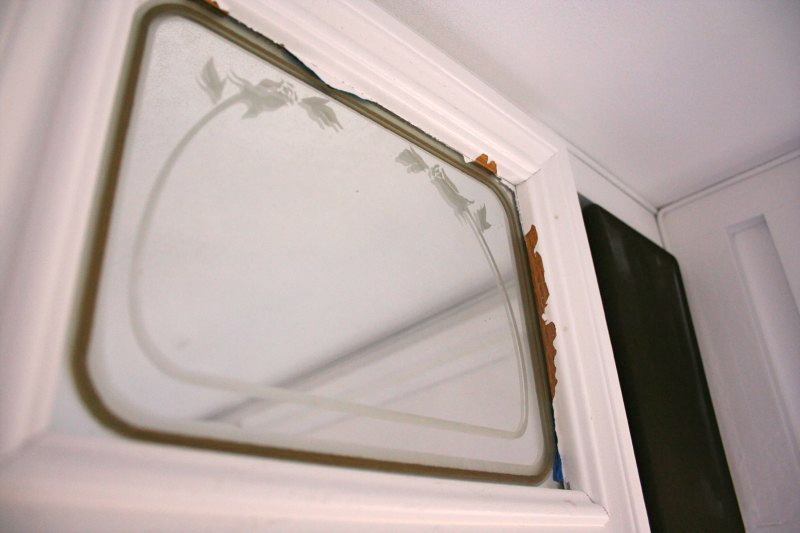 In any case, the tape should be removed immediately after painting regardless of how long it was left up beforehand. Painter’s (Decorator’s)tape in the U.S is most often the blue variety or sometimes purple in color as opposed to the tan or off white household masking tape. Spraying WD-40 is a popular way to remove any sticky residue. Using garbage bags for large surfaces saves on cost. 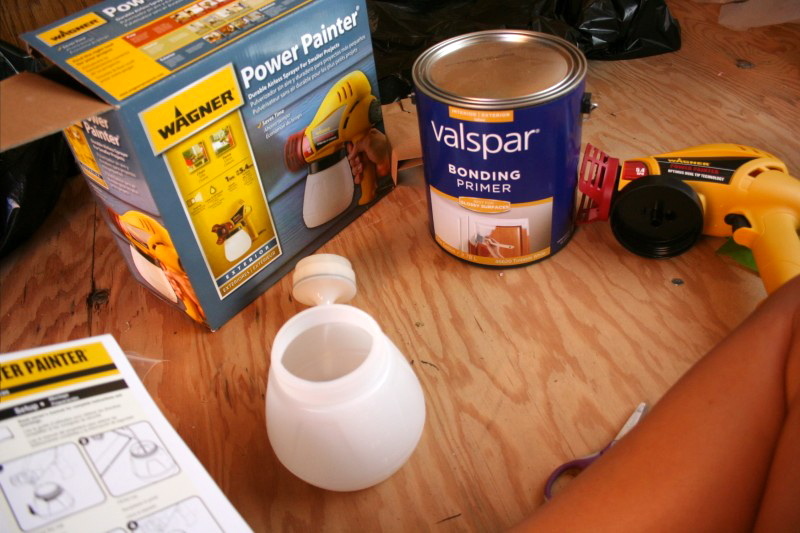 Try to limit the amount of painter’s tape you use – it will get expensive quickly. Use painters tape sparingly around the edges of the garbage bags. It’s better to cover more than you think you’ll need to with the garbage bags. Tape will only do so much, and you can always go back and touch up. Wrap the garbage bags around desired paint boundaries for the most protection. 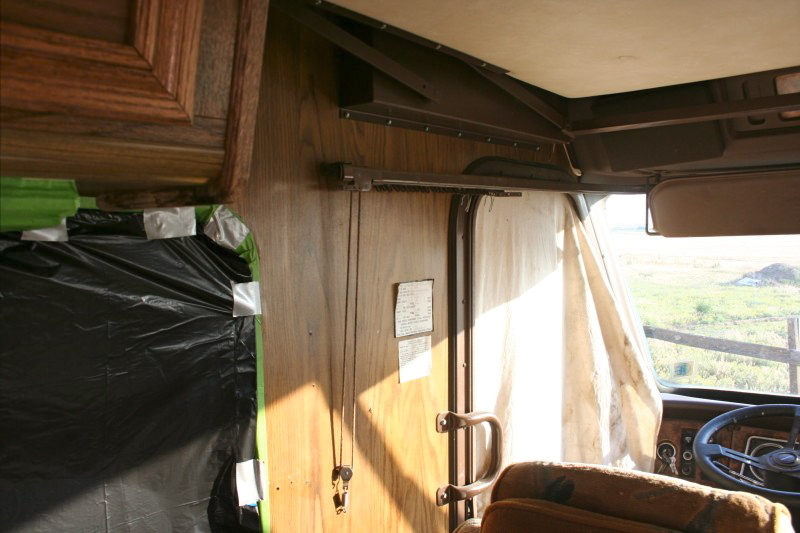 The wood paneling around the cab-over bed proved too difficult to paint with the spray gun. Chelsea went back over this area with a brush. 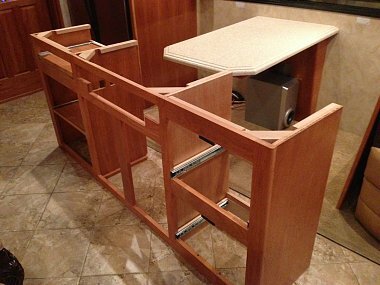 You might consider segregating the entire cab portion of the motorhome from the rear living space. A spray gun will turn the paint into a fine mist that will stain all surfaces that aren’t covered up. It’s better to go overboard on the taping and bagging rather than have to clean paint off surfaces you didn’t want touched. Chelsea decided on a Wagner power sprayer after talking with a sales reps at Lowe’s and doing some more of her own research. At first she looked to save money and bought the cheapest model for $69 but it ended up getting clogged after only a day. 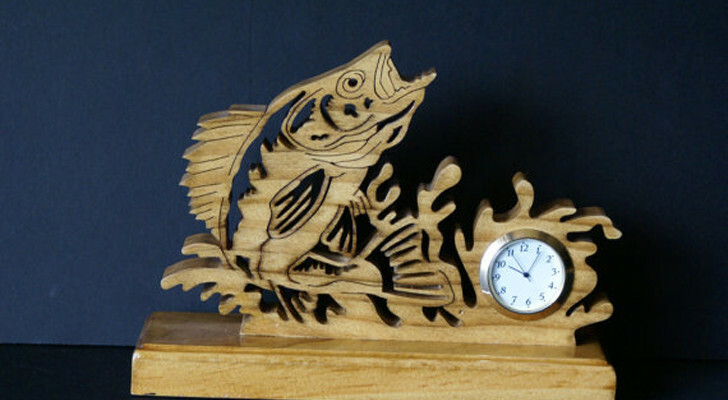 Frustrated with spending hours cleaning it, she went back and got a more capable model similar to this one. Chelsea used a paint/primer combo but the product didn’t work well. She went back and primed everything first with a dedicated priming product. This helps the paint stick to the finished wood cabinets and paneling. 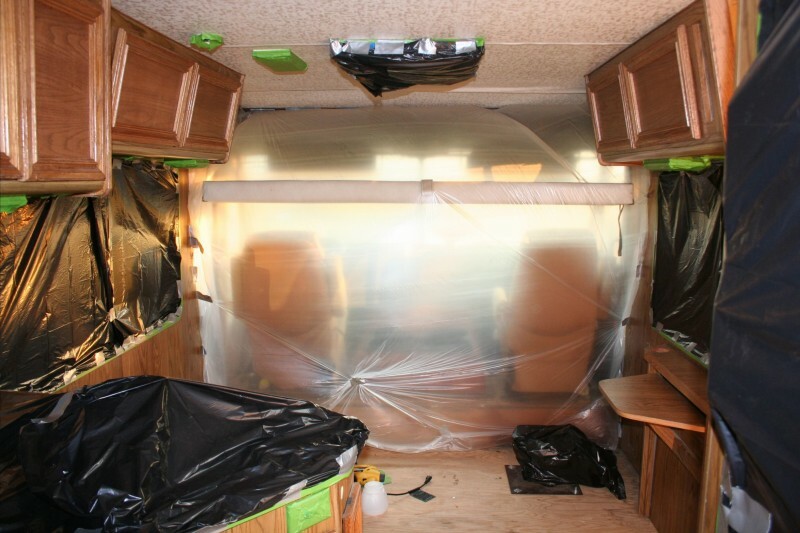 With music blaring and a rag tied around her head, Chelsea set out transforming the interior of her motorhome. This table was a little tricky. It needed to be out to paint on one side, but it also needed to be painted on the other side which was only possible with it closed up. So I had to wait and alternate sides as it dried. Chelsea said that it’s important to wear a mask and open as many windows as possible. 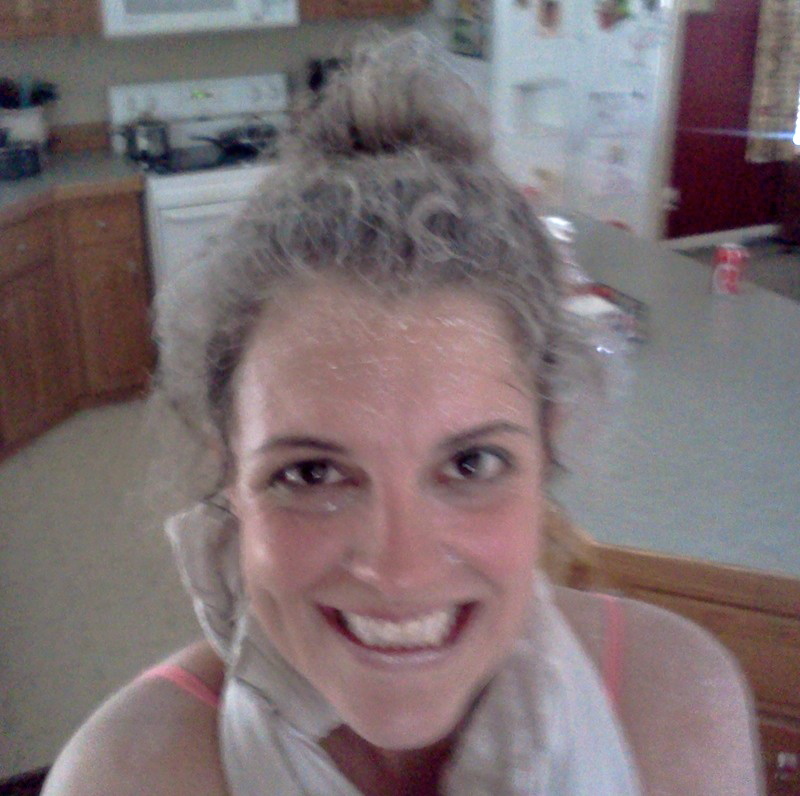 The fumes from spray painting in enclosed areas can easily overwhelm you. When you remove the painter’s tape you’ll probably pull up some paint with it. But don’t worry, you can always go back with a brush and finish off those areas. It’s likely you’ll pull up some paint when you take off the painter’s tape. Don’t worry though, just go back and touch up with a brush. Chelsea wanted to paint the refrigerator and taped it off the same as the other surfaces. 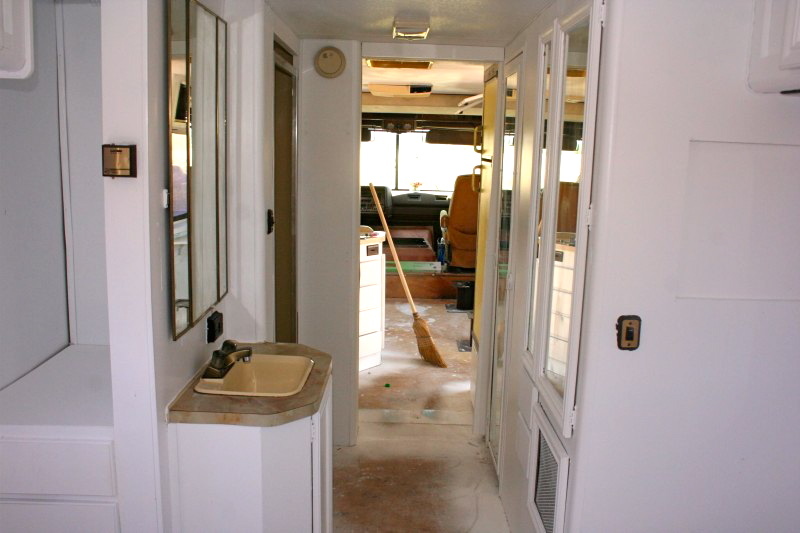 The light-colored paint made a dramatic difference in the feel of the motorhome’s interior. 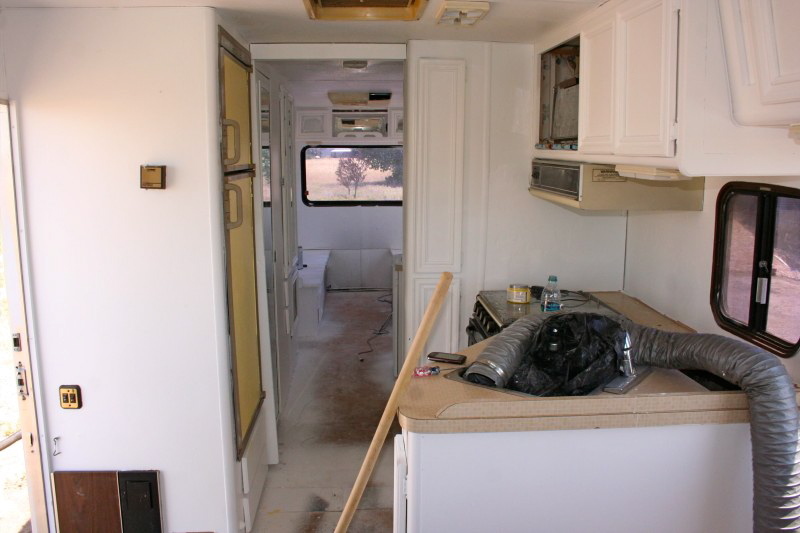 Here is a picture of the rear of the motorhome. 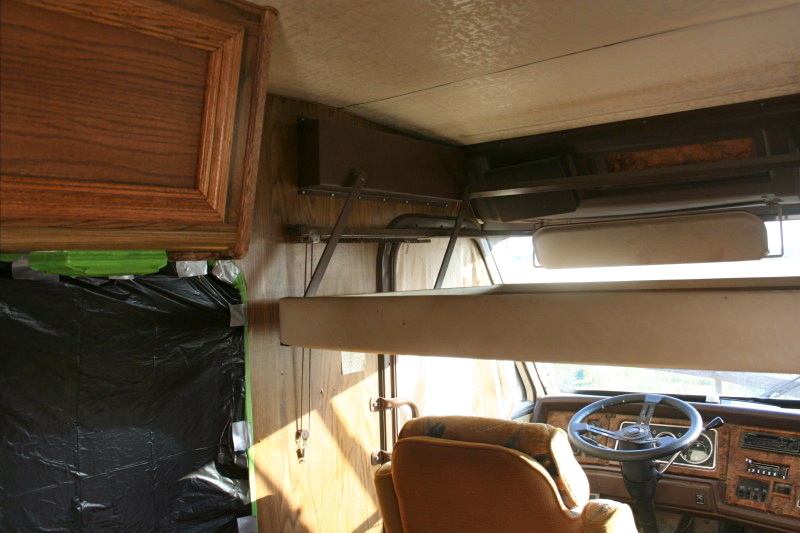 I also forgot to mention, that the ceiling of the RV was made of some vinyl type material. I taped it off at first, and then noticed it looked yellow against the white walls. So I ended up spraying the ceiling white also. It adhered perfectly and looked awesome. Here’s a shot of the ceiling that was painted in the same way as the rest of the interior. You can find more pictures on Chelsea’s site OurSonnyLife. Thanks Chelsea for letting us share your great work. 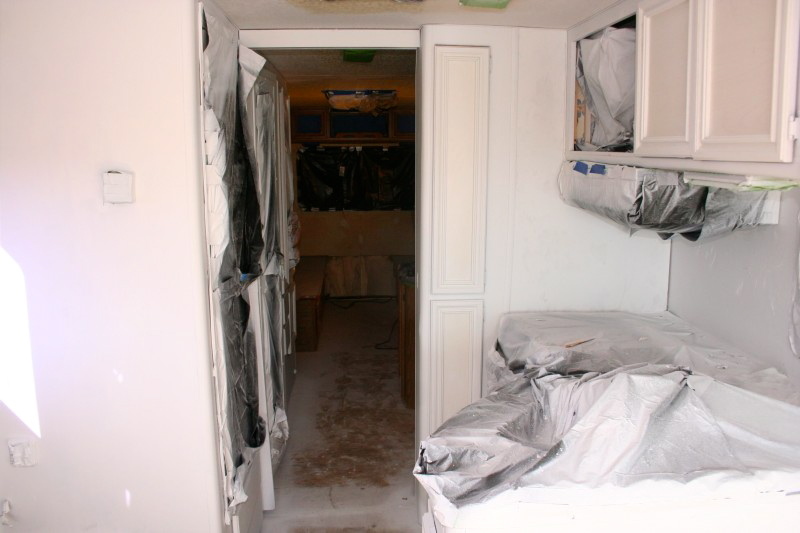 Hi Chelsea or Lorna, I’m wondering what type of paint is the best choice for repainting inside the Rv? Was your Behr paint the latex or interior enamel? 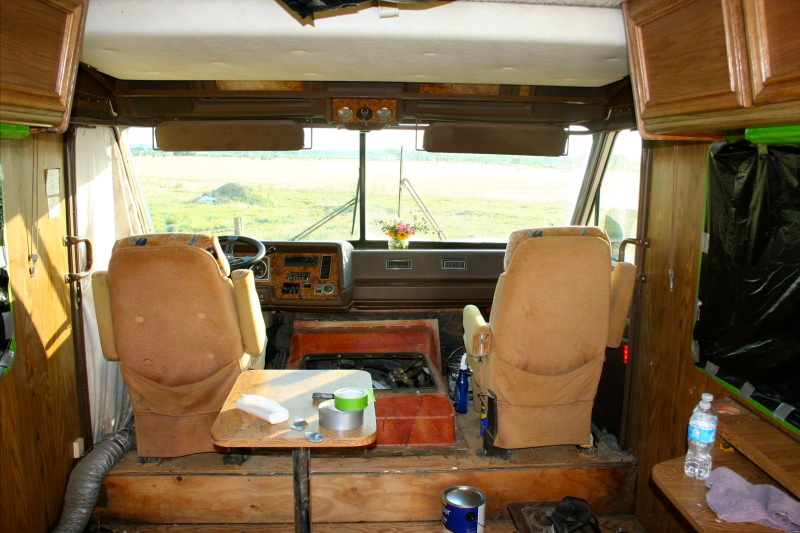 I would think the enamel would hold up better against the high temps inside when the Rv is idle, no ? Wow Lorna, You are the gal! I sure wish you were at the Home Depot by my house. I appreciate the knowledge. Chelsea, the place looks great! Albeit not finished. So where Can I go to see the finished project? I admire your gumption. I am new to your blog… Thanks for sharing this. 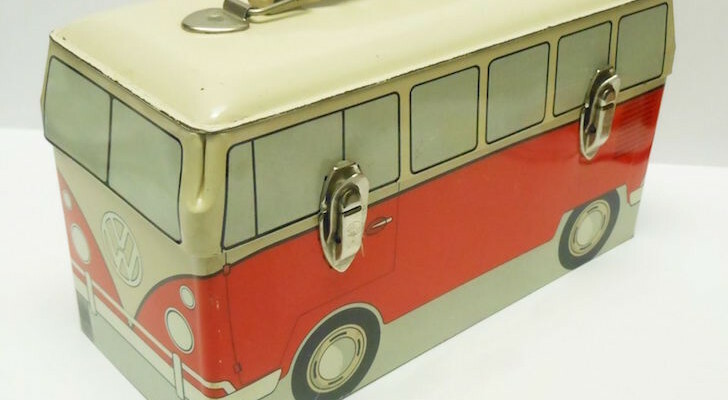 Thank you so much for added comments – I am planning to paint in our 1977 motorhome and am hoping for the same beautiful results! I especially liked Lorna’s great advice – you don’t want to skimp/scrimp with such a large job! I am planning to pain the ceiling (yellowed/vinyl-ish) Do you think it will still cover as well? I’m planning to take all of Lorna’s advice! Thanks Lorna for the great advice. Honored to have a paint professional weigh in! Forgot to mention, the $69 Wagner sprayer is for stains not latex paints. If she had read the package she would have known that. “SOME” latex paint means the cheap stuff that has been thinned down. You will not get a decent spray rig for shooting latex paint for under $100 unless it is a special buy during a Black Friday sale. READ READ READ the packaging information. [quote]Chelsea used a paint/primer combo but the product didn’t work well. [/quote] Chelsea either didn’t fully explain to the associate at Lowes what she was doing or Chelsea ignored the advice that was given to her. The Primer in the Paint+Primer products is not the type of primer she nneded. It covers colour, not material. She needed what we refer to as a primer primer. Primers are made to do a specific job. Paints like Behr Premium Plus Paint + Primer (and most paints) have a primer in them that makes one layer of latex stick to the previous layer. Also it covers a little better than the cheap paints. Behr Premium Plus Ultra Paint + Primer covers the darker colours better plus it’s easier to clean and stands up to abuse better. To paint over paneling, wallpaper, cabinets, you need a Primer like Kilz or Bullseye. First you must clean everything really well with a TSP product (a TSP substitute is fine). Rinse well. I suggest wiping it all back down with white vinegar. 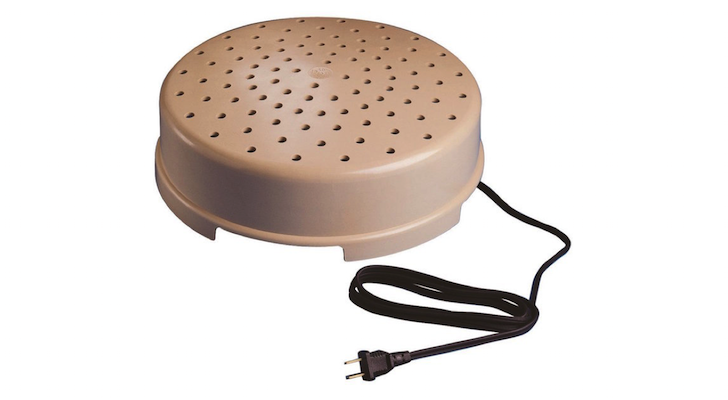 Let dry well. Tape. Prime with a good primer. With painting, prep is everything. Next is use the best brushes/rollers you can buy. If you have a rough primer coat, then that will show thru your paint. I also suggest that you degloss (sandpaper or liquid deglosser) cabinets first. READ the directions on the cans and packages. BTW, I am the certified paint associate at a Home Depot. I have taken many, many classes to become certified in paint.